More insight into the possible solutions for Q2. A very nice exercise on lines and planes! Many but not exhaustive solutions! Find errors if there are. 3 aH bH cH dH aV bV cV dV pH rH Name: _______________________________ Roll Number: _________________ BATCH: _________________ c2 b2 d2 a1 c1 b1 a3c3 b3 c4 b4 d4 Q2 A, B. Given are two planes ABC and DEF, and the two points of a triangle PQR in the horizontal plane. PQ is parallel to the plane ABC in its edge view. In that view, P is at a distance of 25 mm from ABC. 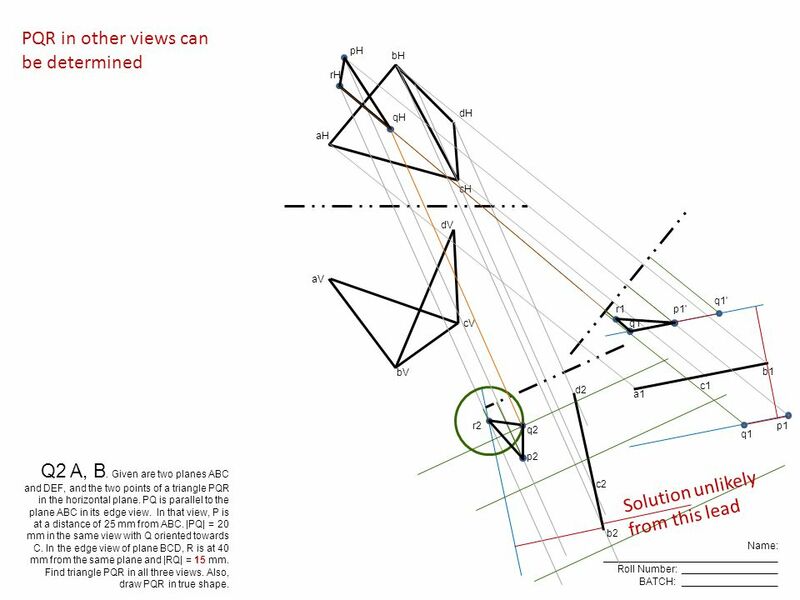 |PQ| = 20 mm in the same view with Q oriented towards C. In the edge view of plane BCD, R is at 40 mm from the same plane and |RQ| = 15 mm. Find triangle PQR in all three views. Also, draw PQR in true shape. 4 aH bH cH dH aV bV cV dV pH rH Name: _______________________________ Roll Number: _________________ BATCH: _________________ c2 b2 d2 a1 c1 b1 p1 p1' q1 q1' r2 q1” q2 p2 qH r1 Solution unlikely from this lead PQR in other views can be determined Q2 A, B. Given are two planes ABC and DEF, and the two points of a triangle PQR in the horizontal plane. 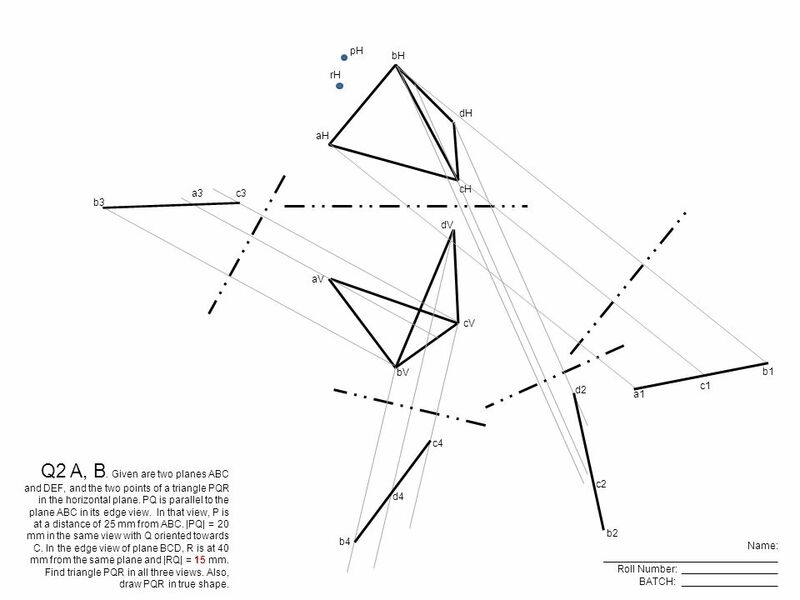 PQ is parallel to the plane ABC in its edge view. In that view, P is at a distance of 25 mm from ABC. |PQ| = 20 mm in the same view with Q oriented towards C. In the edge view of plane BCD, R is at 40 mm from the same plane and |RQ| = 15 mm. Find triangle PQR in all three views. Also, draw PQR in true shape. 5 aH bH cH dH aV bV cV dV pH rH Name: _______________________________ Roll Number: _________________ BATCH: _________________ a1 c1 b1 c4 b4 d4 p1 p1' q1 q1' q1” pV' pV r4 rV r1 p4' p4 q1” q4" qV” qH” Hit and trial to determine q Q2 A, B. Given are two planes ABC and DEF, and the two points of a triangle PQR in the horizontal plane. PQ is parallel to the plane ABC in its edge view. In that view, P is at a distance of 25 mm from ABC. 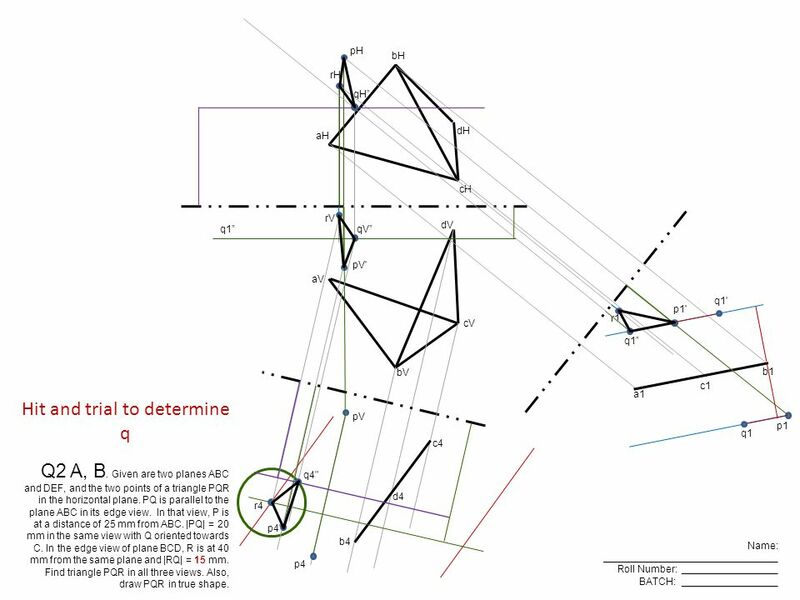 |PQ| = 20 mm in the same view with Q oriented towards C. In the edge view of plane BCD, R is at 40 mm from the same plane and |RQ| = 15 mm. 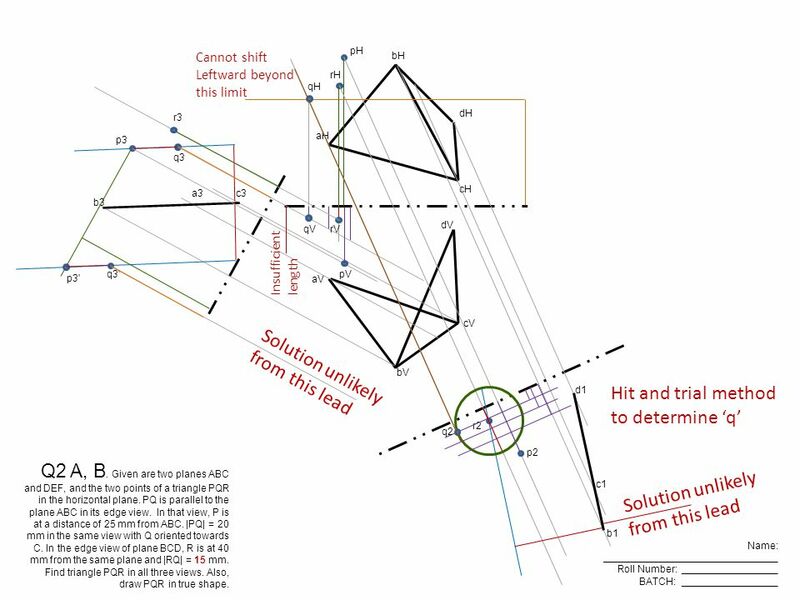 Find triangle PQR in all three views. Also, draw PQR in true shape. 6 aH bH cH dH aV bV cV dV pH rH Name: _______________________________ Roll Number: _________________ BATCH: _________________ a1 c1 b1 c4 b4 d4 p1 p1' q1 q1' q1” pV' pV r4 rV r1 p4' p4 Solution unlikely with q' q1' ? ? Hit and trial to determine q Q2 A, B. Given are two planes ABC and DEF, and the two points of a triangle PQR in the horizontal plane. PQ is parallel to the plane ABC in its edge view. In that view, P is at a distance of 25 mm from ABC. |PQ| = 20 mm in the same view with Q oriented towards C. In the edge view of plane BCD, R is at 40 mm from the same plane and |RQ| = 15 mm. 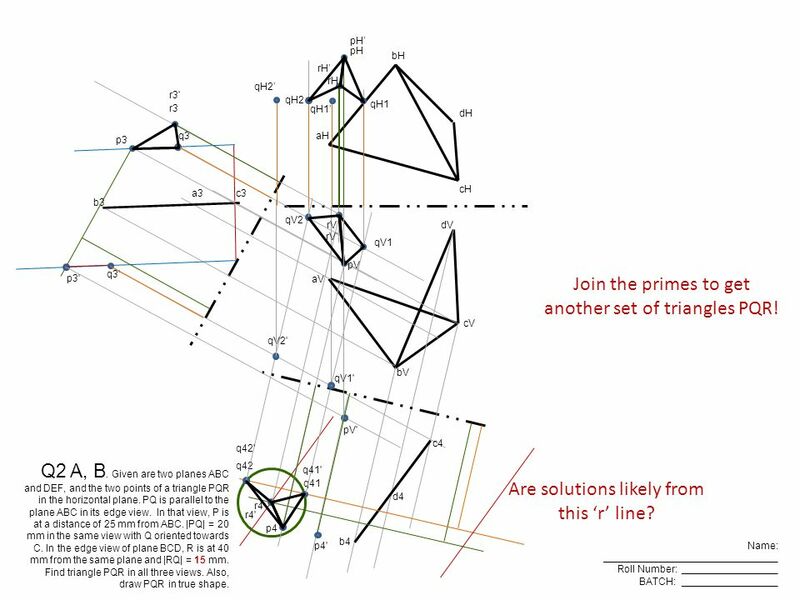 Find triangle PQR in all three views. Also, draw PQR in true shape. 7 aH bH cH dH aV bV cV dV pH rH Name: _______________________________ Roll Number: _________________ BATCH: _________________ a1 c1 b1 c4 b4 d4 p1 p1' q1 q1' q1” pV' pV r4 rV r1 p4' p4 q1 q4 qV qH Hit and trial to determine q Q2 A, B. Given are two planes ABC and DEF, and the two points of a triangle PQR in the horizontal plane. PQ is parallel to the plane ABC in its edge view. In that view, P is at a distance of 25 mm from ABC. 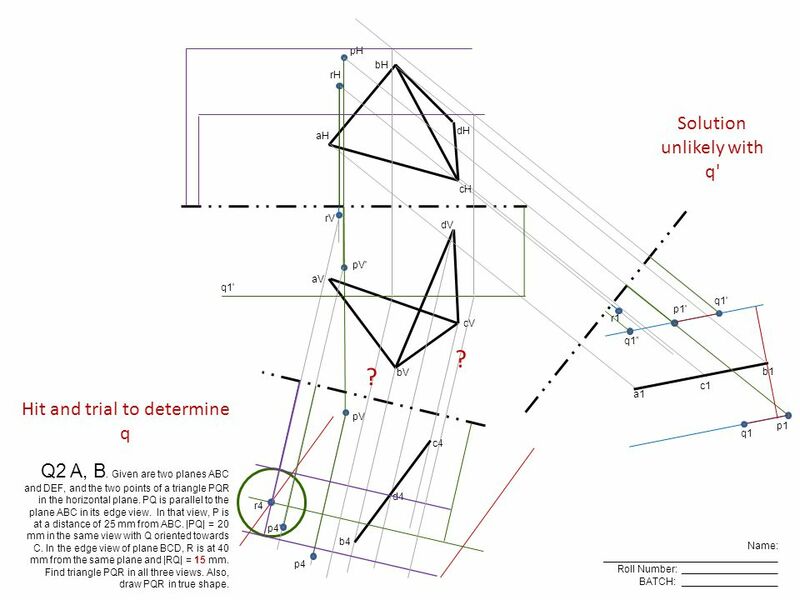 |PQ| = 20 mm in the same view with Q oriented towards C. In the edge view of plane BCD, R is at 40 mm from the same plane and |RQ| = 15 mm. Find triangle PQR in all three views. Also, draw PQR in true shape. 8 aH bH cH dH aV bV cV dV pH rH Name: _______________________________ Roll Number: _________________ BATCH: _________________ a3c3 b3 c4 b4 d4 p3 p3' q3 q3' r4 rV q41 q42 qV1 qV2 qH1 qH2 pV p4 r3 q41' q42' pV' p4' r4' rV’ r3' qV2' qV1' qH2’ qH1’ pH’ rH’ Join the primes to get another set of triangles PQR! Are solutions likely from this ‘r’ line? Q2 A, B. Given are two planes ABC and DEF, and the two points of a triangle PQR in the horizontal plane. PQ is parallel to the plane ABC in its edge view. In that view, P is at a distance of 25 mm from ABC. |PQ| = 20 mm in the same view with Q oriented towards C. In the edge view of plane BCD, R is at 40 mm from the same plane and |RQ| = 15 mm. Find triangle PQR in all three views. Also, draw PQR in true shape. 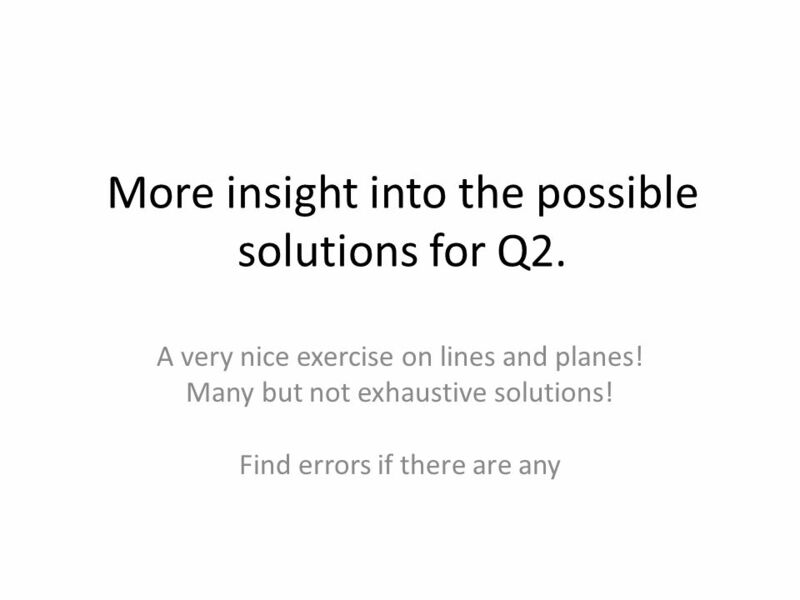 Download ppt "More insight into the possible solutions for Q2. A very nice exercise on lines and planes! Many but not exhaustive solutions! Find errors if there are." Aim: How do you construct the 9-point circle? Do now: What is the orthocenter? The orthocenter of a triangle is the point where the three altitudes meet. TA 101 T hink and A nalyze Anupam Saxena Associate Professor Mechanical Engineering Compliant and Robotic Systems Lab Indian Institute of Technology Kanpur. We Are Learning Today How to Construct a triangle using 3 different methods. This will involve strengthening your knowledge and understanding of how to. PROJECTIONS OF PLANES 1.POSSIBLE POSITIONS A.With Respect to H.P. Parallel to the H.P. Perpendicular to the H.P. Inclined to the H.P. B.With Respect to. Auxiliary Views In creating the Auxiliary View you measure the distance for the front view to top view. Using Trigonometry to find area of a triangle The area of a triangle is one half the product of the lengths of two sides and sine of the included angle. 10.3 Images in Concave Mirrors. Concave Mirror Unlike a plane mirror, a curved mirror produces an image that is a different size, shape, and/or orientation. EXAMPLE 1 Classify triangles by sides and by angles SOLUTION The triangle has a pair of congruent sides, so it is isosceles. By measuring, the angles are. The two shaded faces of the prisms shown are its bases An altitude of a prism is a segment joining the two base planes and perpendicular to both The faces. G 22 Pythagoras’ Theorem Subject Content References: G2.1, G2.1h GCSE Maths Geometry & Measures. © T Madas. Look at the following expressions: 2ab + 2bc + 2ac abc 4(a + b + c ) Suppose that a, b and c are measuring lengths, while the numbers 2 and.